We sell pomegranates for fresh consumption in Italy and in some European markets.We are organized to serve the GDO brands, the Normal Trade wholesalers and the Horeca channel, in particular restaurants and bars.The minimum order for wholesale purchases is one pallet, consisting of about 160 carton boxes.Delivery in Italy, based on the availability of the fruits, normally takes place within 1-3 working days from the order. On request, we also produce and package ready-to-eat arils, juice, jams and other derivatives. 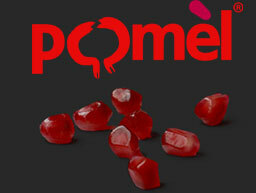 Pomèl pomegranates, carefully washed, selected and calibrated, are packaged in 30×40 cm cartons. Depending on the size of the fruit, the weight of each carton is approximately between 4.70 kilos and 5.50 kilos. Based on the specific needs of our clients, we can use any other format or packaging. Unless otherwise required, Pomèl pomegranates are packaged in a special plastic bag obtained with a special patented technology, specifically designed to keep the freshness of the product intact for as long as possible. The pomegranates thus packaged can be stored, depending on the variety, up to 120/150 days at a temperature ranging from 4 ° C to 6 ° C, preferably with a relative humidity of 95%. Italian rules regulating the use of synthetic pesticides and fertilizers are the strictest in the whole European Union and much stricter than in other non-EU Countries.